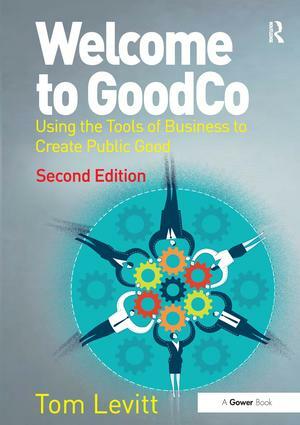 This second edition of Welcome to GoodCo updates the author's critically acclaimed analysis of how the tools of business are being (and ought to be) used to help tackle the great problems of both the planet and of local communities. In exploring the increasingly politically relevant issue of 'responsible capitalism' - and its variations - he asks what it means, where it came from, why politicians are so timid around the issue and what exactly are the obstacles this crusade will have to face. He argues that business doing good has to be supported by a business case, as that is what makes it sustainable, but that huge benefits can be reaped. As 60 of the world's top 100 economies are corporates, not countries, businesses that are not helping to create solutions become part of the problem. Added topics in the 2015 edition include: the growth of social value in the commissioning of services and what business can learn from this; the Social Progress Index as an alternative to GDP; and the role for greater corporate citizenship as a way of enhancing employee engagement, with all the benefits that this can bring to a company. It updates the stories and data which made the first edition so readable. In a world in which businesses of all sizes frequently find some of their practices at odds with the basic principles of their customer or citizen promise, Welcome to GoodCo offers a realistic, commercially hard-nosed approach to reframing business in society. "Levitt's impressive and well researched book makes an important contribution to the debate on sustainable capitalism. He argues with great insight that we need to look beyond the traditional views of the public, private and voluntary sectors, each in its place, as this will hold us back in the globalised, interdependent world of the twenty-first century." "I very much enjoyed the book that is within the tradition of the "pracademic" - reflective and evidence based with a set of clear outcomes." "Society is a complex web of mutually dependent stakeholders who need each other to be successful and sustainable but who are constantly having to re-evaluate their roles and relationships as the world and our values change: this book explains the dilemmas currently being faced by these different groups and seeks to explain a way forward so that all elements of society can benefit." "Today our political economy should not be limited to a zero sum game about the market and the state. There are many sorts of market, good and bad. The essence of political economy is how to fashion market institutions so that they serve a broader purpose. Tom, as a politician, knows that that challenge is not just one which should be of concern for MPs and regulators, but to all of us, as managers, savers, workers and citizens." "It would be fantastic if a future Government and EU Commission were to use his ten 'demands'� and the wider book as the basis for the reform of the UK and EU business regulation, to contribute to a more socially responsive and responsible capitalism. And it would be even more fantastic if every business leader were to read to the book and take the argument, case studies and 'demands' as a strategy for moving their companies towards being Good�! "Welcome to GoodCo is an engaging and accessible read. It makes an important contribution to progressive thinking on responsible capitalism"
"Not many responsibility authors are able to write first hand as teacher, charity trustee, Labour MP and consultant and Tom Levitt's new book Welcome to GoodCo is all the better for it. Levitt's diverse experience means this book reads as credibly when exploring political machinations as it does when considering how business acts for good (though Levitt's one CV gap is as employee of a private company!). Significantly, CR is barely mentioned until three quarters of the way in and before you get there you'll pass one of the clearest analyses of the recent crisis I've come across. The book is an easy read but still poses difficult questions; some downbeat messages are countered by the upbeat tone. So, buy this for a more nuanced view on how business makes a difference and you won't be disappointed." Tom Levitt was a member of parliament from 1997-2010. He is a writer and consultant on charity partnerships, a sustainability adviser to Boots and a non-executive director of both Digital Outreach and Good Measures ethical business consultancy. He is a trustee of the eithical lender Fair For You, The Work Foundation and three other charities and writes occasionally for the CBI Great Business Debate blog and The Guardian online. He is a fellow of the RSA and an associate of the Institute of Corporate Responsibility and Sustainability with an honorary doctorate from the University of Derby, UK.